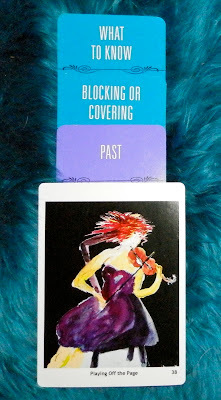 Today's Draw: Playing Off the Page in the What to Know Now That's Been Blocked or Covered in the Past position from Illuminate! Life Journey Cards and the Deck of 1000 Spreads. Do you have the courage to zig when others zag? Do you zig because you don't want to be a zagger? Or do you zig because every fiber of your being tells you that zigging is the right way to go? Playing Off the Page is about stepping out of the boundaries and following your inner music. It's like thinking out of the box. But, spiritually speaking, it goes much deeper than that. In order for change to happen—in order for the ideals hippies sang about and Buddhists meditate on to ever happen—people have to stretch beyond what they've learned and done thus far. For the second or third time this week, I'm saying that we have to start doing the hard things...the things we resist because we hold on so tightly to the fear-based thinking of our past. In the 1940s, Nazis gathered up everyone who was Jewish or gay and mass exterminated them. Because they didn't like them. They felt they had legitimate reasons. Jews and gays weakened the human race. And slowly they convinced others that exterminating this kind of people would cleanse the population and the world and its people would be stronger than ever before. You'd think Americans would have learned something from the ideals we fought for when we battled the Nazis, but the fear of Communism in the 1950s brought about McCarthyism. We needed to rid American society, not just of all Communists, but of anyone who even associated with Communists. And like the witch hunts of the 1600s, word of mouth and casual proof was enough to slander a person, leading to loss of career and, in the case of the witch trials, even loss of life. Such was the fear of even coming into contact with someone who had come into contact with someone who had been identified as a scourge. We look back at all those things and say "those days are past. We're wiser now." But what we need to know today that's been blocked or covered from the past is that it's the people who dare play off the page—the ones who are trying to to break their little corner of the world out of the fear-based justifications that perpetuate Nazi or McCarthiest mentality—are the ones that often end up being silenced. Today. And if you're part of the silencing, you're part of the problem. Anytime you make any single person "other" than you...they're a monster, they're evil, they're archaic—you're part of the problem. Think about the way you felt about the "other side" in last year's presidential election, for example. I certainly thought the other side was irrational and THEY certainly made me angry and even fearful, because what if THEIR side won? This also happens frequently along the religious and sexuality divides. If you can't love and embrace them and look into their eyes and listen to them...if you avoid them, mock them, blackball, reject or otherwise derail them...you're part of the problem. With McCarthyism, it went even further. If you were caught talking to a suspected Communist, you were lumped in with them. You were blacklisted. There was zero tolerance if you opened your heart and mind to someone who was an outcast. If you talked to them, you were dangerous. You, too, were supporting the Communist path. And others needed to know to avoid you. In short, if you dared play off the page, your music was taken away. We all struggle with doing the hard things. One of the hard things I'm trying to do is venture into the world of lovingkindness, a Buddhist principle where you love and open your heart to the "least of us" in the same way you open it to someone you love. This is why I will give money to "beggars" and never once concern myself with what they might use it for. It's not my job to question their need, but to serve it when moved. I'm also kind to people others have written off. It's not my place to judge why they might need kindness, compassion and love, but to offer it when I can. But wait, what if they're going to shoot heroin with the money you give? What if the person society has written off is unkind? Well, those are fear-based concerns. They're concerns that make those people "other". Only treating them as I would treat myself makes them one with me. Only releasing the fear that their unkindness may hurt me...only trusting in myself, having confidence in myself and trusting in the universe helps me rise above. I say "when I can" because there will always be circumstances when I will act from fear or protection. And I won't walk up to someone threatening to shoot me if I come closer...that would be stupid. But I can push myself to do the difficult thing, even it means I stand alone. I can release my need to control what they do with the money or my fear of words they might say, little by little. And instead of cutting myself off from the chance to practice this principle by ever-tightening my circle the way McCarthy did...by making others dangerous by association...I can try to see the sameness in even the source of the "other-ness". I can try to do that hard thing, even if I fail. Because this is the only chance I think our society has to move beyond the music we've written since the beginning of time. And it's the way I choose to challenge myself spiritually on my path. It hurts no one but the fearful. It threatens no one but the fearful. But in that way, walking this path can often feel lonely—there are a lot of the fearful out there. It can also feel profoundly free and moving. Because feeding the purest, most unconditionally loving places in our heart—as difficult and tenuous as it may sometimes be—pays back in peace and divine love in those moments when you can drop the fear of being misunderstood by the fearful, and you move confidently forward in your aloneness knowing you're doing what's right for both your own—and the planet's—evolution.